Running Time: 1 hr. 10 min. 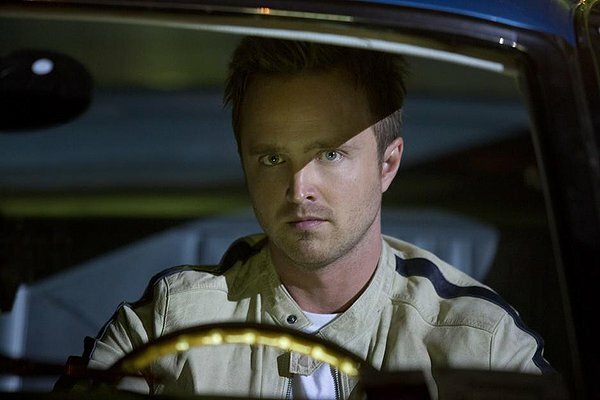 On the heels of two Emmys for his role as Walter White’s meth-dealing sidekick on the hit series Breaking Bad, it’s natural—indeed, obligatory—that Aaron Paul would his parlay his notoriety into an expanded acting career. Still, the first half of my opening sentence portends Paul’s challenge: the iconic television series gave him fame, but will audiences ever view him as anyone other than Jesse Pinkman? Unfortunately, in his first star vehicle, Paul is just spins his wheels. Need for Speed is adapted from the hit video game series, and if that isn’t enough to give you a start on the ride to the multiplex, note the fact that it’s directed by Scott Waugh, who cut his teeth helming the visually slick, narratively empty agitprop Act of Valor. Paul plays Tobey Marshall, a grease monkey and sometimes illegal street race driver in upstate New York. Strapped for cash, Tobey accepts an offer from Dino Brewster (Dominic Cooper), an old adversary of utterly unexplained origin, to build a souped-up Mustang. Tobey accomplishes his job, but an impromptu post-sale street race goes tragically wrong when Dino wrecks Pete (Harrison Gilbertson), Tobey’s young and mouthy friend. Tobey takes the rap for Pete’s death, and after two years in the clink, emerges with revenge on his mind. His plan involves driving cross-country to California and beating Dino in the DeLeon, an invite-only underground car race run by a rich hipster known only as the Monarch (Michael Keaton). Along for the ride in the Mustang is the car’s broker, Julia Maddon (Imogen Poots), and together they must dodge Dino’s deadly obstacles just to make to Cali. With its visual bombast, paper-thin characters and forced testosterone-injected bravura, “Need for Speed” is a brazen non-Michael Bay Michael Bay movie. The plot is both ludicrous and simplistic, hinged together by the ubiquitous roar of muscle cars and some impressive stunt work. Tobey and his miscreant gearheads hold themselves on the right side of some unspoken racer’s code, unless it applies to the untold innocent motorists and bystanders endangered by their illicit doings. Poots hails from west London, but she contorts her polished Chiswick lilt into a brogue straight out of the East End. Meanwhile, Keaton preens in extreme closeup throughout, his unceasing nattering via the Monarch’s Internet podcast quickly becoming tiresome. The rest of the supporting cast is instantly forgettable, the consequence of writing that doesn’t supply any foundation for the characters’ backgrounds and motives. A scene in which one buddy (Rami Malek) strips completely naked while quitting his cubicled 9-to-5 is completely divorced from the rest of the storyline. Paul acquits himself as well as possible, breathing occasional emotion into an emotionless screenplay and preserving a modicum of optimism for his next film role. Still, here he’s ultimately a cog in a corporate marketing engine so hollow it makes The Fast and the Furious look like Bullitt. Let’s just call it Braking Bad.